Unique. Simple. Easy to distribute. Cost effective. Attractive. 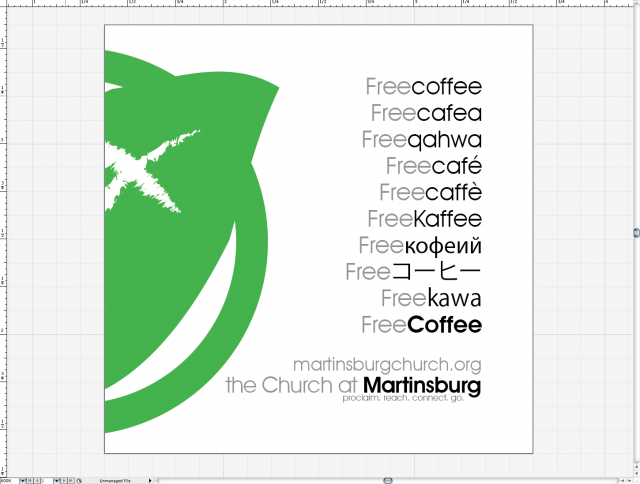 These were the goals of the design for the Church at Martinsburg (C@M) Coffee Card. 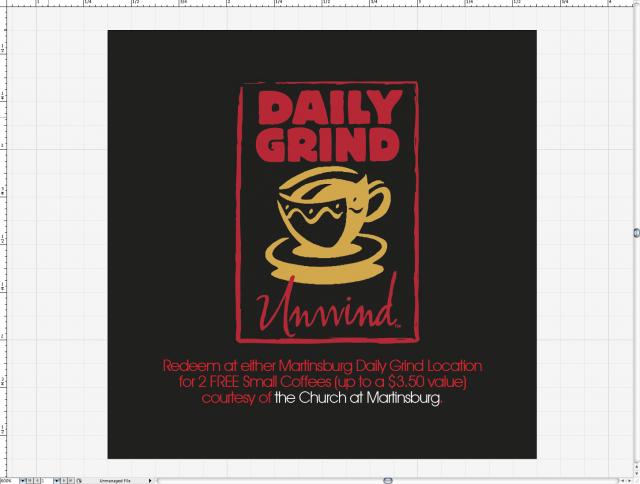 I was tasked with creating a simple, unique card offering free coffee at a local coffee shop that could be given to people as a way of introducing them to a church start in Martinsburg, WV. After seeing what other churches had done, generally selecting a traditional business card format, we decided that a non-traditional 2” x 2” business card was a unique way to go for this piece. In addition to the goals above, we also needed to communicate church information, the fine print of the offer and the location where the offer could be redeemed. I started with the idea of “Free Coffee.” Coffee has become much more than a drink in our culture. We use it as a means of communicating, not just getting through our day. It’s also a favorite way for the pastor to connect with people so offering free coffee made sense and what better way to represent free coffee than by offering it in various languages. The branding of the church was also an important aspect because at the time, the church was new and didn’t have a presence in the community beyond the bit of branding that we had done. With such a small space, I chose to emphasize the church logo and use the church web address as the primary point of contact. The back of the card - black and red - provided a nice contrast to the front - white and green and featured the logo of the coffee shop as the primary graphical element. The reputation of the coffee shop helped provide some legitimacy to the entire promotion. The final result is a 2” x 2”, die-cut (rounded corner) card on 14PT glossy paper stock which is still in use today. 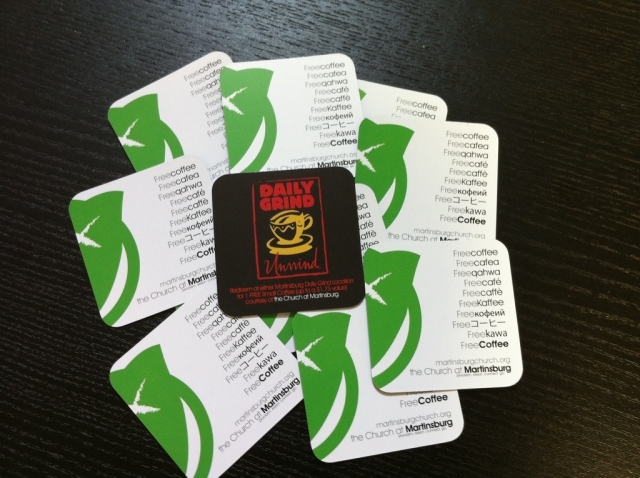 The church, in partnership with The Daily Grind, a local coffee shop, uses the cards to provide more information about the church. Each card is good for two cups of coffee.